Palos Verdes captured its eighth straight Bay League football championship with a resounding 28-0 win over rival Peninsula last Friday. The Sea Kings, who finished 5-0 in league, were led by Ryan Wilson who ran for 210 yards and three touchdowns. 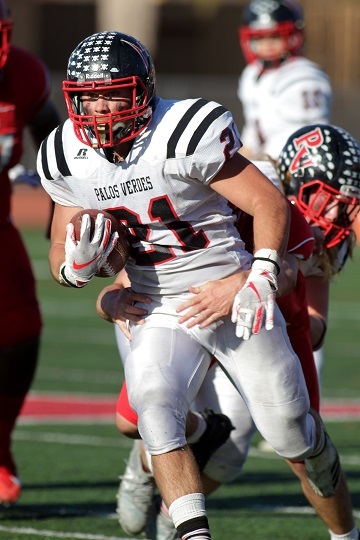 Palos Verdes (7-3) will host Del Rey runner-up Harvard-Westlake (6-4) in the first round of the CIF-Southern Section Division 5 playoffs Friday at 7 p.m. at El Camino College. Peninsula (6-4) received an at-large berth in Division 11 and will host Ontario Christian (6-4) at South Torrance High School. In boys water polo, Bay League runner-up PV (22-6) defeated Aliso Niguel 20-12 in a Division 2 wild-card game Tuesday and traveled take on Foothill/Santa Ana in the first round Wednesday. Quarterfinals take place Saturday with the semis held on Wednesday. In Division 3, Peninsula (18-7) held off El Segundo (10-12) by a score of 8-6 on Tuesday and will host fourth-seeded Edison (16-13) on Thursday. In girls tennis, PV and Peninsula both secured spots in the Open Division which begins Friday. Bay League champion PV (14-3) plays at Corona del Mar (17-2) while Peninsula (11-7) travels to Arcadia (19-0).